The Healthy Students, Promising Futures Learning Collaborative supports states and school districts in increasing access to school health services. Healthy Schools Campaign and Trust for America’s Health co-convene the Healthy Students, Promising Futures Learning Collaborative to support increased access to school health services through Medicaid reimbursement. The collaborative launched in July 2016. 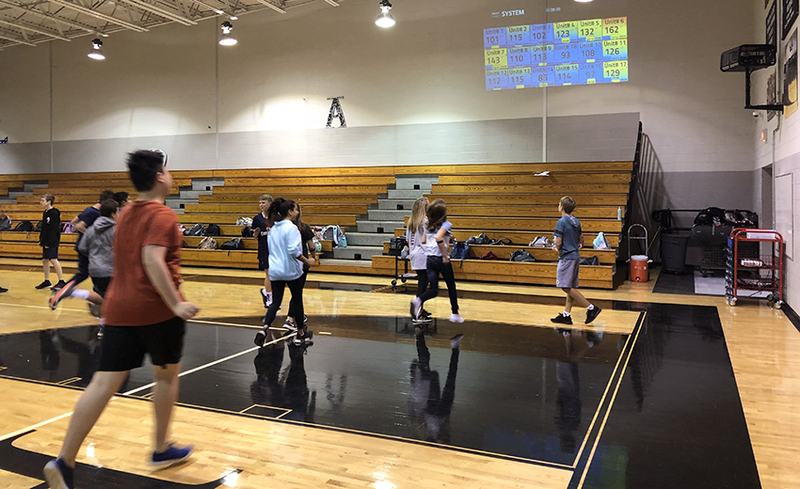 Research shows that healthy students learn better, and that school-based health services, both physical and mental, are critical to supporting student health and wellness. Increasing access to school health services is a key strategy for improving children’s access to healthcare and the quality of care they receive. Despite this, more than half of public schools currently do not have a full-time school nurse or school counselor, and less than five percent of the nation’s students have access to services through a school-based health center. Low-income schools are more likely to have no school nurse or have a higher ratio of students to nurses when compared to higher-income schools. Schools can and should be a part of the health system. With more than 49 million children attending public schools across the country, schools present an important and efficient opportunity to reach vulnerable and underserved children, thereby supporting children’s health and achievement, while reducing overall healthcare costs. Recent policy changes present new opportunities to better integrate schools within the health system. In December 2014, the Centers for Medicare and Medicaid Services clarified that the Medicaid free care policy does not apply to school health services, removing a major barrier to accessing funding for school health services. This policy change, coupled with a healthcare system that prioritizes prevention, population health, care coordination and chronic disease management, presents important opportunities to increase access to and resources for school health services, both physical and mental. Now, states, school districts, health systems, public health agencies and community health providers must come together to rethink how school health services are delivered and leverage these policy opportunities to create more comprehensive and coordinated care in schools. In 2016, with support from Healthy Schools Campaign and Trust for America’s Health, the U.S. Department of Education, the U.S. Department of Health and Human Services and the Centers for Medicare and Medicaid Services launched the Healthy Students, Promising Futures Learning Collaborative to support states and school districts in implementing strategies to increase access to school health services through Medicaid reimbursement. Healthy Schools Campaign and Trust for America’s Health now co-convene this initiative with the support of over a dozen national partner organizations. The Healthy Students, Promising Futures Learning Collaborative brings together state teams committed to increasing access to school health services through Medicaid reimbursement. All participating state teams convene in person in Washington, D.C., twice per year for peer-to-peer learning and to receive targeted technical assistance. In addition, participating state teams receive ongoing technical assistance throughout the year from national partner organizations and content experts. Through a partnership with Columbus City Schools (CCS), Nationwide Children’s Hospital provides the licensed mental health professionals and training for school personnel to implement evidence-based school-wide prevention programs for students and teachers, in addition to providing primary care services through their Care Connection school-based clinics and mobile care centers. Non-profit health system ProMedica invests in making sure there is a school nurse in every Toledo Public School because data shows that school nurses keep kids healthy, improve attendance and prevent costly hospital trips. By using a process known as acuity analysis, Austin Independent School District and Dell Children’s Medical Center work together to analyze data such as insurance coverage, number of illness visits to school nurses and the number of students receiving case management for chronic conditions to determine the most effective way to spread resources across the district’s schools. 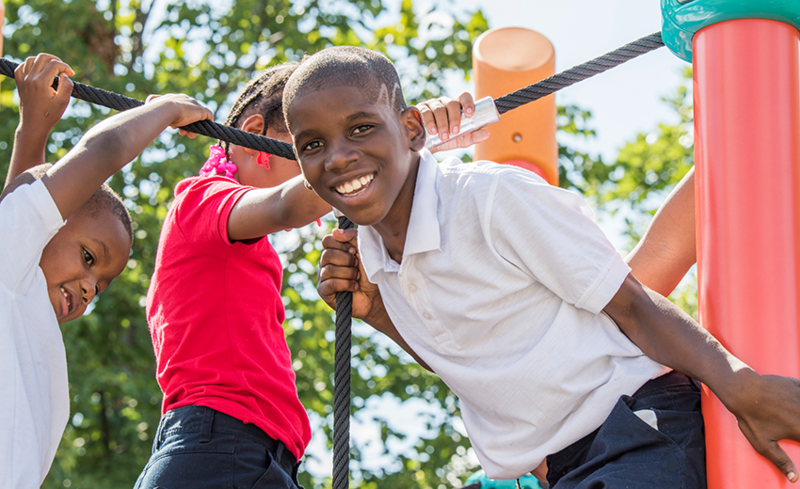 A 20-year partnership between Grand Rapids Public Schools and Spectrum Health has produced a flexible model that is used in districts throughout the region. Embedded school nurses oversee effective on-site delivery of healthcare, and the program utilizes a variety of funding streams to provide effective care. An innovative data-sharing agreement allows the D.C. Public Schools, Department of Health and Department of Health Care Finance (the District’s Medicaid agency) to effectively target outreach and resources to schools and students with the greatest unmet needs. Trillium Community Health Plan Coordinated Care Organization (CCO) and Lane County Health and Human Services (HHS) work together to prevent tobacco and drug use and improve access to care, including funding teacher training and implementation of the evidence-based prevention programs, such as the PAX Good Behavior Game, in Lane County schools. California recognizes that chronic absence data can be an important tool for better understanding poor academic performance. Chronic absence has been integrated into the state’s Local Control Funding Formula and is included as a school quality measure in the state ESSA plan. 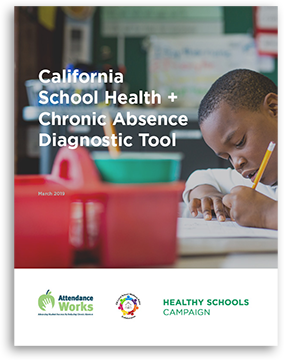 This tool is intended to help California education leaders identify and address the health-related causes of chronic absence. 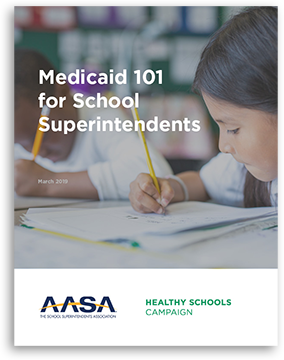 Today, new opportunities exist to enhance the role that Medicaid plays in school, creating a sustainable source of revenue to support school-based health and behavioral health services .This brief for school superintendents provides an overview of how school districts can leverage Medicaid to support children's educational and health outcomes. This brief highlights existing efforts to integrate education data, such as chronic absenteeism, into health and public health accountability systems, describes common barriers and best practices, and suggests key opportunities for further exploration to advance this work. The Healthy Students, Promising Futures Learning Collaborative, in partnership with Healthy Schools Campaign and Trust for America’s Health, was launched in July 2016 to support states in expanding Medicaid services in schools, including physical and behavioral health services. From the National Association for Medicaid in Education. From the American Federation of Teachers. This document provides guidance for health care advocates to engage a diverse set of partners to advance implementation of the medicaid free care rule change. From the National Health Law Program. From the California School-based Health Alliance. This blog offers concrete examples of how advocates and stakeholders can support school-based Medicaid programs, streamlining federal and state reimbursements to school districts and contributing to children's equitable, easy access to high-quality healthcare services. A clear overview of the role Medicaid plays in ensuring student health. From Georgetown Center for Children and Families. 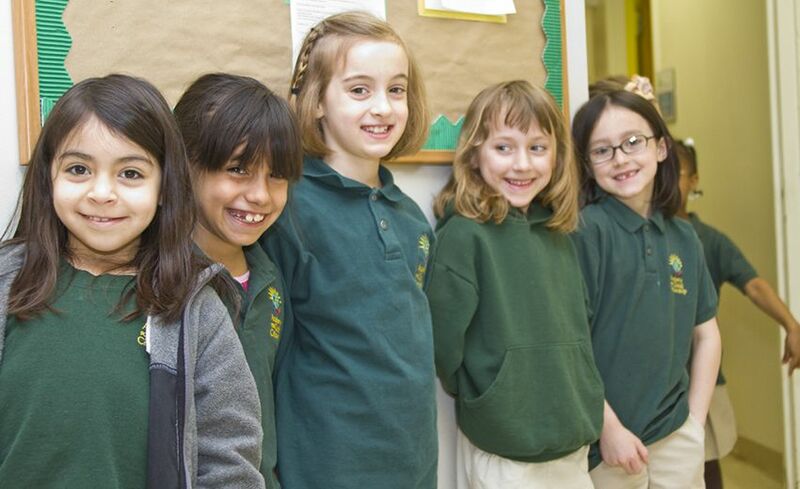 This toolkit focuses on school-based child health outreach and enrollment. From the Center on Budget and Policy Priorities. This guide explores the opportunities provided by School Improvement Plans to address the needs of the whole child, incorporating physical, social, emotional and/or behavioral health priorities into schools. These case studies demonstrate the important role that state health departments can play in strengthening the management of chronic health conditions in schools, even in an era of limited funding. From Healthy Schools Campaign and Trust for America's Health. This toolkit focuses on state and local action steps and practices to improve school-based health. It is structured around five key high-impact opportunities. Leveraging Medicaid to Expand Access to Health Services in Schools: An Update from the Healthy Students, Promising Futures State Learning Collaborative. The Healthy Students, Promising Futures Learning Collaborative includes a growing number of state teams from Departments of Education and Medicaid who are exploring ways to expand health services in schools and leverage funding through Medicaid. The Collaborative is supported by the U.S. Department of Education, the U.S. Department of Health and Human Services and the Centers for Medicare and Medicaid Services, in partnership with Healthy Schools Campaign (HSC) and Trust for America’s Health (TFAH). This webinar provides an overview of the Collaborative and highlight preliminary findings, successes and challenges that the state teams are facing. Managed care is the predominant delivery system for children’s health coverage in Medicaid. What is more, managed care plans are important partners when designing innovative care delivery models. This webinar provides basic background about Medicaid managed care and how managed care plans support children’s health through Medicaid. 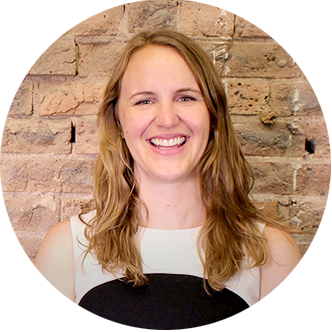 In addition, the webinar provides general guidelines about what plans may cover and how the benefit design may vary from state-to-state. Because every state’s experience with managed care is different, this is not be a deep dive into individual state policies, but it does answer general questions about the critical role managed care plans play—and includes a thoughtful discussion about how schools could work with managed care organizations. This webinar provides an overview of the components of a comprehensive school behavioral health system and highlights two examples from Colorado and California where schools or school districts are implementing innovative models to provide behavioral health promotion, prevention and treatment services in schools using a multi-tier system of supports (MTSS) utilizing federal and state funds. An overview of current national trends in Telehealth. The Healthy Students, Promising Futures Learning Collaborative includes a growing number of state teams from Departments of Education and Medicaid who are exploring ways to expand health services in schools and leverage funding through Medicaid. The Collaborative is supported by the U.S. Department of Education, the U.S. Department of Health and Human Services and the Centers for Medicare and Medicaid Services, in partnership with Healthy Schools Campaign (HSC) and Trust for America’s Health (TFAH). This webinar provides an overview of the Collaborative and highlight preliminary findings, successes and challenges that the state teams are facing. 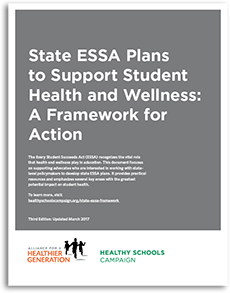 The Every Student Succeeds Act (ESSA) recognizes the vital role that health and wellness play in education. This document focuses on supporting advocates who are interested in working with state-level policymakers to develop state ESSA plans. It provides practical resources and emphasizes several key areas with the greatest potential impact on student health. This issue brief reports findings from the National Health Law Program’s review of state Medicaid plans (SMPs) for provisions that may impact states’ ability to implement the federal government’s recent reversal of the “free care policy.” Specifically, we reviewed SMPs for provisions related to Medicaid reimbursement for services provided in schools that are available free of charge to beneficiaries and others in the community. This includes SMP provisions that directly prohibit coverage of such services as well as those that might indirectly prevent coverage. The change in the free care policy presents an important opportunity to increase access to and resources for school health services. While the December 2014 State Medicaid Director letter clarified that school health services delivered to the general student population, not just those included in student Individualized Education Programs (IEPs), are eligible for Medicaid reimbursement, action is required from states and school districts to implement this change. 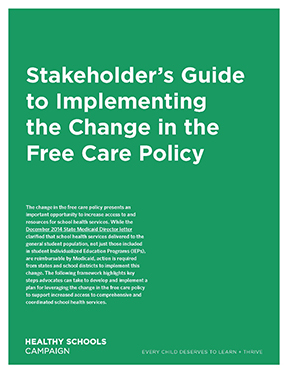 The following framework highlights key steps you can take to develop and implement a plan for leveraging the change in the free care policy to support increased access to comprehensive and coordinated school health services.